If you’d had asked me as a child I would have told you that the first part is German and the second part is silly. Rabi? What does that mean? Well, Wikipedia already told you that rabi is Swiss German and means turnip. The standard German word for rabi is rübe. But a kohlrübe is not the same as kohlrabi. Or at least that’s what I always thought. To be honest until recently I had no idea what a kohlrübe is. Apparently it a vegetable we Northern Germans call Steckrübe (rutabaga.) Some others call kohlrabi kohlrübe. So there. The only thing this tells you is that many things can be called rübe in German (even your head) and that rüben (correct plural form) must have been an important part of the German diet. Otherwise why would we call every second vegetable rübe? Except for carrots, I have a complicated relationship with all those rüben. As a kid I never cared for the rutabaga soup my grandmother used to make. And I only ever ate raw kohlrabi. I hated the cooked version. Or that’s what I used to think. It turns out I love cooked kohlrabi. What I hate is the German way of preparing it. 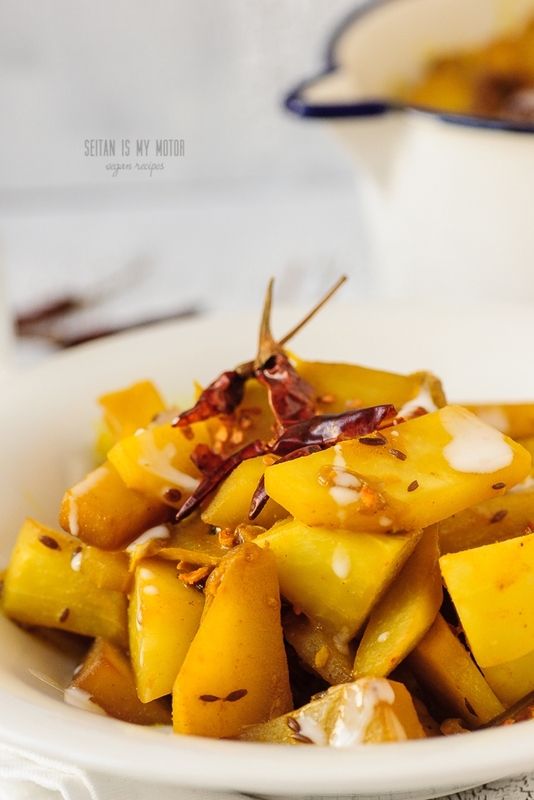 It’s usually cooked in salted water and naked like that it’s added as a side dish to potatoes and meat. That doesn’t sound too good, right? It’s really amazing how uncreative people get with vegetables when their diet is mostly meat based. I sometimes wish my family had been more creative with food. But I also have to admit that their approach didn’t do me much harm. I tried a lot of different things later and today I still experiment a lot. Which makes me finally love kohlrabi! 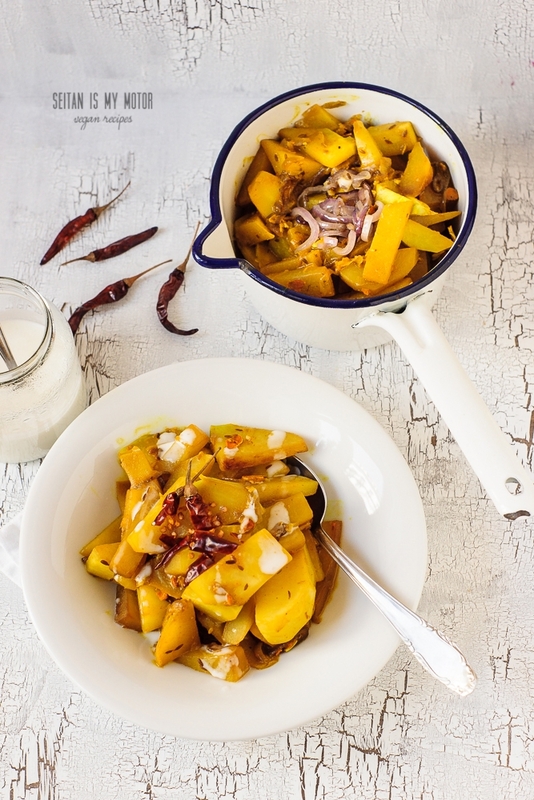 Curry is the perfect way to make everything taste amazing. And this one is quick, too. It makes a great lunch or dinner when you are pressed for time. I used both fresh and ground turmeric because I had them on hand. If you have only the ground version, that’s fine. I recently started to make my own coconut yoghurt and that’s is why the recipe calls for it. Of course you can use coconut milk and a splash of lemon juice instead. Peel the kohlrabi bulbs, cut them in half, slice into disks, and then cut into bite sized pieces. Heat oil in a large cast iron pan. Add onion and cumin and fry for 5 minutes or until the onion is lightly browned. Add Kohlrabi and fry for another 5 minutes, stirring from time to time. Add garlic, ginger, turmeric and remaining spices and stir well. Cover the pan with a lid and cook for another 10 minutes or until the kohlrabi is tender. 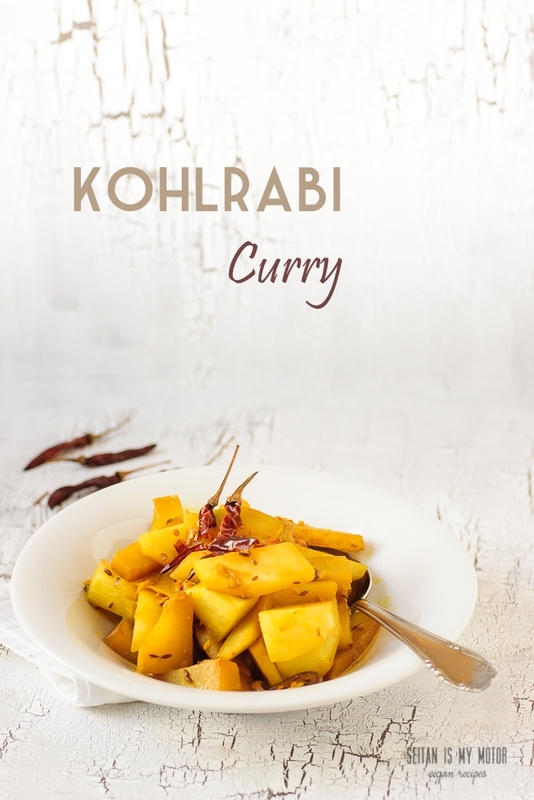 Hallo, ich habe das Kohlrabi-Curry heute nachgekocht. Es hat uns sehr sehr gut geschmeckt uns lässt sich wunderbar varieren z.B. mit Kardamom und zwei weichen kleingschnittenen Birnen. I love Kohlrabi! My mom used to make it all the time when I lived there. I have turnips in the fridge and will prepare them your way this week. Can never go wrong with a curry for sure. I don’t think I’ve ever used kohlrabi before, though I see it around occasionally. Next time I see some I shall remember this recipe. That’s interesting. It is such a common vegetable over here. I cannot even imagine not seeing it. Exactly! Everything rube was suspect, and I detested Kohlrabi, unfortunately a popular because available during the post-war years when I grew up. Getting older and sometimes wiser I found my way back to Kohlrabi. Your imaginative recipe is yet another step in my on-going Kohlrabi-rapprochement – thank you! LOVE your little etymology lesson on the word ‘kohlrabi’, by the way. So interesting. Big word geek over here!! Thank you! I am such a word geek, too.